The 8th installment in the project Shrine Maiden series. Imperishable Night is a straightforward shoot'em-up, except that the player controls a flying girl instead of the typical spacecraft. When enemies are shot down, they may drop various "items", such as Power Ups, Point items or other special items with various effects. The game consists of 6 stages, each stage having a mid-boss and an end-of-stage boss. In Imperishable Night, the player can choose between four combinations of human/daemon, all characters from previous games: Reimu Hakurei/Yukari Yakumo, Marisa Kirisame/Alice Margatroid, Sakuya Izayoi/Remilia Scarlet and Yomu Konpaku/Yuyuko Saigyouji. A special feature of this game is that the character the player uses is switched when the "slow" button is held down. The player starts at (fire) power 0. Red enemies will drop Power Up items when shot. Collecting power up items raises the power by 1, gradually increasing the damage that the shots do. The max fire power is 128. Like in Perfect Cherry Blossom, extra lives are earned when the player has collected a certain amount of Point items. In Imperishable Night, each boss also has a "Final Spell", which is only fired if the player has collected enough Time Orbs during the stage (including the boss fight). Imperishable Night features a point system which involves a resource management mechanism rather unique for the series. Like in earlier games, point items yield more points the higher up on the screen they are collected, up to a certain height (the invisible "Item Max Point Line", which is about 1/3rd from the top of the screen), where they yield max. Also, above this Item Max Point Line, the player will automatically absorb all items on screen if they press the "slow" button (shift) (though playing Marisa, the player does not have to press slow). This max starts at 50,000 points. However, this max can be increased by collecting "time orbs". In earlier games, holding down the "slow" button merely changed the player's movement speed, sometimes slightly changing the direction of the shots, but in Imperishable Night, the player also switches character, between human (normal speed) and daemon (slow speed). While all enemies can be shot down in either of the forms, certain enemies releases "familiars" (bright white shapes) that are tangible only when the player is in human form. In human form, the familiars can be shot down and colliding with a familiar will kill the player. In daemon form, the familiars are invisible and only represented by a transparent circle, and cannot be shot down nor touched. However, any bullets that the familiars fire will still be tangible and lethal. The trick is that when the master dies, all its familiars are also killed, turning them, and all enemy bullets in their immediate vicinity, into small time orbs. These time orbs are automatically absorbed by the player regardless where on screen, and will increase the Point Max. 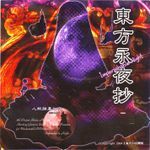 This system makes Imperishable Night the first game in the series where the player can actively destroy enemy bullets. As the familiars are visible and can be shot down when the player is in human form, the typical way to earn time orbs is to, when a familiar-firing enemy enters the screen, enter daemon form and kill the master. Time orbs also start appearing when the player has stayed in one of the forms for a longer period of time. The game features a "human/daemon" meter, that varies between -100% (fully human) and 100% (fully daemon). This meter gravitates towards one extreme when shooting in either of the forms, so shooting while in human form will decrease the meter and shooting while in daemon form will increase the meter. Once the meter is below –80% or above 80%, time orbs will start appearing. Below –80%, time orbs are simply formed when the player's shot hits an enemy. Above 80%, time orbs are instead earned by grazing bullets (letting the bullets almost hit you). There is a final detail about this meter that is interesting for advanced players: It is accelerated when the player collects time orbs. This is not relevant when it comes to the shooting/grazing bonus time orbs, as the player is already at an extreme when these start appearing. However, it is useful when shooting down a master with a lot of familiars on screen. As shooting down a master all the while not shooting down its familiars requires the player to be in daemon form, players who want to stay below –80% (in order to gain the time orb bonus from hitting enemies) might find the necessity to switch to daemon form annoying. However, even if the time orbs are automatically absorbed, it does take a significant amount of time for them to actually reach the player (about a second). So, upon killing a master (in daemon form), the player can release the "slow" key and revert to human form, before all the time orbs are absorbed, having the meter quickly decrease to -100% again. Time orbs increase the Point Item max, but collecting the specified amount also triggers each Stage Boss' "Final Spell". Being hit during the Final Spell does not lose the player a life, but clearing it without dying results in significant bonus points. Time orbs also increase the "death bomb" time; the split second the player has to hit the bomb button after being hit, to avoid losing a life. In earlier games, this time window was merely a split second; in Imperishable night it can be as long as half a second if the player has many Time Orbs. The human / daemon meter is also reset to 0%. Hence, dying in Imperishable Night is not nearly as severly punished point-wise as in its predecessor. Bombing during a Spell Card attack will miss you the Spell Card bonus. Also, bombing will revert the human / daemon meter. Avoid moving slowly during the stages, except when familiar masters enter the screen. When a familiar master enters the screen, stop shooting, enter daemon mode, and don't kill the master until he has several familiars on screen. During boss fights (which contain a lot of graze-worthy bullet streams), stay in daemon mode. Try to avoid death bombing (bombing the moment you are hit by a bullet). Advanced: If the master fires aimed bullets, try to lure him into firing them where his familiars will be, so you can transform the bullets into time orbs. In the combination Marisa/Alice, Marisa fires missiles and Alice fires a thick laser. However, Alice's laser doesn't disappear immediately upon release of the slow button; instead it remains for about 1/5th or 1/4th of a second. Marisa's missiles, however, are fired immediately upon release of the button. Players found they could abuse this by pushing/releasing the slow button 5 times a second, keeping Alice's laser going all the while firing missiles. This is known as "the Malice-cannon". Though actually doing more damage than simply the laser, that is all it does, and it doesn't break the game, so it was considered a feature, not a bug.